The Smooth Horned Frog has excellent camouflage, hidden among the fallen dead leaves by its patchy brown colouring, warty body and pointed ‘horns’. This helps them stay unseen during their sit-and-wait approach to hunting and keeps them hidden from predators. They have a particularly large mouth, which reaches half the length of their body, and this lets them eat relatively large prey such as beetles, crickets, spiders, cockroaches and even smaller frogs. Adult frogs grow to about 5cm -7.5cm in length. Smooth Horned Frogs live in the forest leaf litter and spawn in temporary slow-flowing water within or near boundaries of the forest. When provoked, they have a defensive reaction, which is to flatten their body, stretch their rear legs backwards and front legs forwards and stay perfectly still for several minutes. This confuses predators which find prey by sight, as they look even more like fallen leaves. If they are spotted by a predator, then the stretched defensive posture makes them harder to swallow. 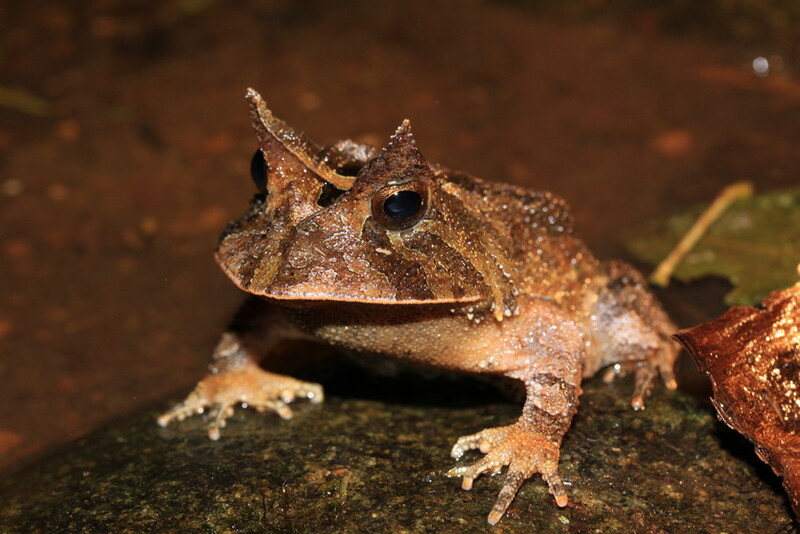 The Smooth Horned Frog is endemic to Brazil. It lives along the coastal stretch of Brazil’s Atlantic Forest, and is found in highland and mountain areas in both primary and secondary forests, as well as persisting in areas where the forest is recently degraded. Although it lives only in Brazil, the IUCN classifies the Smooth Horned Frog as Least Concern, because its range covers a wide area and there is no indication that its numbers are falling sharply. The key threat faced by the frog is habitat loss due to deforestation. It is also taken for the international pet trade, but only at a low level, so the number removed should have no strong impact on populations. Giaretta, et al. (1998) Food habits and ontogenetic diet shifts of the litter dwelling frog proceratophrys boiei (wied). Rev. Bras. Zool. [online], 15 (2), pp. 385-388. Heyer, et al. (1990) Frogs of Boraceia, Arquivos de Zoologia, 31 (4), pp. 231-410. Toledo, L. F. and J. Zina (2004) Proceratophrys boiei (Smooth Horned Frog) – Defensive behavior. Herpetological Review, 35 (4), pp. 375. Rocha, C.F.D., et al. 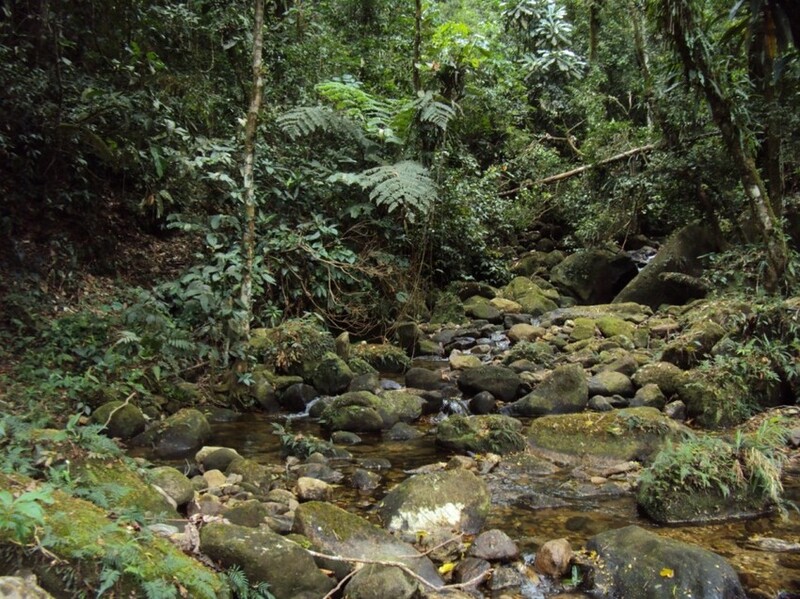 (2007) A survey of the leaf-litter frog assembly from an Atlantic forest area (Reserva Ecológica de Guapiaçu) in Rio de Janeiro State, Brazil, with an estimate of frog densities. Tropical Zoology 20: 99-108.